The LDP party of former Japanese Prime Minister Shinzo Abe, pictured right, won a clear victory on Sunday. Japanese voters handed the Liberal Democratic Party and its allies an overwhelming victory in Sunday's elections, clearing the way for Shinzo Abe to return as prime minister and pursue new stimulus measures to revive the world's third biggest economy. Prime Minister Yoshihiko Noda conceded defeat and said he would resign as president of the Democratic Party of Japan, after the scale of the loss in the lower house became clear. The Liberal Democratic Party ruled Japan almost continuously since 1955, until it was forced from power three years ago by the DPJ. Public broadcaster NHK said the LDP and its coalition partner, the new Komei party, gained at least 302 seats in the 480-seat lower house. CNN affiliate TV Asahi said the LDP/Komei coalition gained at least 312 seats. "The LDP is inheriting a struggling economy, regional tensions and questions over Japan's role in Asia," Abe said in interviews after polling. "The economy is at the bottom. It's our first mission to turn it around." Abe has held the post of prime minister once before, becoming Japan's youngest premier since World War II in 2006. But he resigned a year later after a series of scandals. Since then, Japan's government has been led by six different prime ministers. Despite an abbreviated campaign season, Abe has made his policy prescriptions clear. The LDP leader called for "unlimited" purchases of government bonds, and a doubling of the Bank of Japan's inflation target to 2%, to haul the economy out of recession. Japan's growth domestic product for April to June contracted at an annual rate of of 0.1% -- a trend that accelerated from July to September, leading to a contraction of 3.5% for the quarter. Economists are increasingly pessimistic about Japan, and many expect economic growth to contract again in the current quarter. As the third largest economy in the world, Japan has suffered from weak exports, a trade spat with China and continued fallout from last year's nuclear disaster and tsunami. More bad news was delivered Friday in a survey of manufacturers showing that factory operators are more pessimistic now than at any point in the previous three years. "It's very unusual for monetary policy to be a focus of attention in an election, but there was strong public support for our view," Abe said Monday. "I hope that Bank of Japan takes this into account." 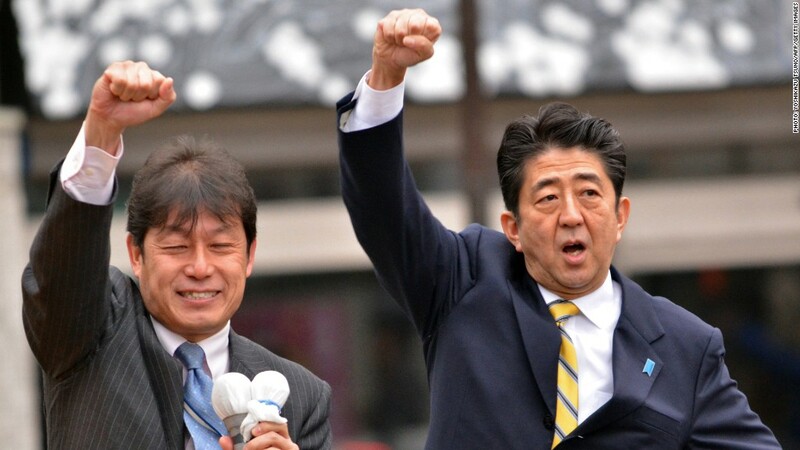 Analysts said the scale of the LDP victory would give Abe plenty of scope to determine policy, given a two-thirds majority in the lower house and forecasts of winning a majority in the upper house in next July's elections. "The ministry of finance and Bank of Japan will, in our view, have to go along with the stance of a government that won this much public support," said Naka Matsuzawa, a fixed income strategist at Nomura, in a report on Monday. The first steps could come as early as this week, when some economists expect the Bank of Japan to boost its asset purchase program at a two-day meeting that will end on Thursday. Abe also wants further fiscal stimulus, and is planning a supplementary budget aimed at boosting spending on infrastructure projects. But his powers to maneuver things around will be limited, given Japan is the most indebted major country in the world.